With the server coming down yesterday again, we ordered a hardware check and the service technican found a defective CPU cooler. So the machine was shutting down cause it simply was getting too hot. The cooler is replaced now and hopefully the server issues are gone now. The announced second update for Flames of War just went online. You can now select from almost 90 choices spread over 10 nations. Many thanks go to Arnaud and Marc for setting up the updates. With SMOG, The Thirteenth Hour, a skirmish tabletop in the Victorian area made by Smart Max, our support for tabletops has grown again. We just implemented a first update of the Flames of War factions. You can now choose from a couple of "Early War" lists for the Poles and the French. We'll add another update in the next days which will focus on the "Late War". Due to the server's crash on Tuesday evening the NTR computation couldn't be executed. Please be patient and wait for next week. We're suffering from a couple of technical issues over the last days. The server has a problem with its power management, so that it's shutting itself down uncontrolled and doesn't wake up again afterwards. As we cannot restart it ourself in some cases, we have to wait for a technican from the datacenter. Crash 1 was Monday night. Server got restarted Tuesday morning. Crash 2 was Tuesday afternoon. The second crash was hiding behind a destroyed fibre optics of our datacenter during construction works. The repair lasted into the night so that we discovered the server being down again not before today. A technican restarted the server asap. We'll now try to discover the source of the probelms together with the technicans. This can take some time as it can either be a software or a hardware issue. If we have to suffer from more crashes, we'll do our best to get the page back online as soon as possible. We're also cutted from our e-mails, so for any status updates you have to check our Facebook page or watch our Twitter stream (see top right for links). A couple of long days are behind. In a phenomenal location right at Lake Geneva in Montreux the Swiss organized the top event of the year. It was an awesome atmosphere with 52 teams from 30 countries. You can get some impressions on our Facebook page. Each with Warhammer Fantasy and 40K. Next to the ETC there'll be Side Events again for those who come along with their teams and want to experience the flair of an international tournament. For all those staying at home there'll be a couple of possibilities to stay informed. Besides the miscellaneous forums you can visit our Facebook page, follow our Twitter account or watch the hashtag #ETC11 in general. From the T³ team Blackhawk, Echsodus (IT gurus) and Tom_ep (40K judge) will be on the stage. For all participants and interested parties: Have fun! We've just updated out ETC page with the team tournament and the participating teams. This year we've got 62 teams (Fantasy+40K) from a total of 37 countries. Simply amazing! Additional organizers don't have to be approved by admins anymore. If a user gets added as an organizer, he'll receive an e-mail with an approvement link. Every user will know if he wants to be organizer or not. In addition the new feature will reduce workload for the admins. Please assure that you've got a valid email address in your profile or you won't be able to approve the organizer access. A direct notification on the website is planned. Please report if something seems to be broken. As we get questions about "how to organize a tournament" every now and then, we'd like to offer an organizer howto on T³. We'd be happy if a couple of experienced organizers could come together and share their knowlegde and expierence with the community. The idea is a howto covering aspects like material, rules, time and money planning and so on. Please contact Blackhawk, if you'd like to help. Currently a bunch of emails are send in a wrong language. In most cases this happens when a player without a T³-account signs up for a tournament in Belgium. The current database design cannot handle the bilingualism of the country and sends emails in French which is currently set as the default for Belgium. I'll try to improve the scripts. We just updated the factions for Kings of War by Mantic Games with the current beta army lists. So you now can choose Orcs, Humans and Abyssal Dwarfs too. We currently have some problems with the newsletter being send in a wrong language. Please report if you're affected and tell us if you're using an account and what language setting you're using. 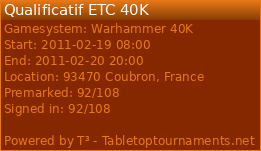 The greatest tournament event 2011 is coming... checkout our recently updated ETC page with everything about the ETC 2011. This year it's held in the Switzerlands. More and more teams are signing up for the team event and we're again powering the sign up for the official European Singleplayer Championship (ESC) and the side events for the people who're at the location, but not participating in the team event. Around a year ago I've spoken about the future of T³. A lot of things happened in the last 12 months. Especially the European Tournament Championchips (ETC) are mentionable. As announced back then something has to change for the future. With a little delay this year we just uploaded the tournament awards for 2010. We've given away 29 awards in total this time. Congratulations to all the organizers who did a marvelous job with their events! After the possibility to share our tournament calendar on your website or forum by just linking an automatically updated image, you can now share the current information about any tournament. The image will show the basic data and the current number of signups. You'll find soon links to share in the organizer panels. We'll look into further improvements of the image sharing and also a full HTML version for website inclusion.